On the western edge of New England lies the Green Mountain State, an agriculturally bountiful beauty attracting travelers to its majestic greenery every year. Here hordes of horticulturists, muralists, and writers spend their days becoming inspired by its natural grace. Among that group are the 3,000 sugar makers in residence who have turned the Vermont maple syrup refining process into its own form or art, picking up more steam, more expertise with every homemade batch. True Vermonters know the comforting effect that their products have on people. Nothing beats the feeling of waking up in the morning to the aroma of a fluffy stack of Gormly’s of New Haven’s pancakes, oozing with warm maple syrup from a local sugar house. A hearty breakfast motivates you to conquer the day ahead. As the top maple syrup producer churning out over a million gallons yearly, the Vermont community is proud of its sugar houses, all 1,500 of them, and have dedicated festivals to its celebration. Annual events are centered on this sweet sticky delight, especially in the spring, the season of syrup. Not a breakfast person? 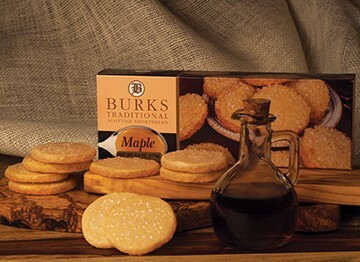 That’s okay, because locally you’ll find other maple-inspired sugary delights crafted by Vermonters that tantalize the senses. We’ve spent close to a year perfecting the maple flavor in our Traditional Scottish Shortbread line, and we’re certain you’ll be able to taste our efforts. Vermont is brimming with art, nature, and fine confections, and whether you’re preparing for an upcoming trip or thinking about planning one, you’ll definitely want to fit this filling breakfast staple into your stay here. Do you know someone traveling to or from Vermont? We have a scrumptious selection of shortbread maple cookie and breakfast baskets that will satisfy their sweet tooth the whole journey long.